Smartphones felt a tinge of jealousy at CES 2013 as many of the oohs and ahhs were around 3D printing booths, especially over the CubeX. But the printer is only part of the equation in 3D printing; 3D modeling software is just as necessary, and if it’s hard to use then you won’t be printing much, and the quality of your prints may not be to your liking. So intuitive software is essential, and the various modeling programs approach intuitiveness in different ways, like separate windows for the X, Y, and Z axis, or hotkey and mouse movement combos for twisting and turning objects. Ultimately though, there’s no substitution for seeing an object in the three dimensions of physical reality. At least there wasn’t before Leona3Do, which was also on display at CES this year. 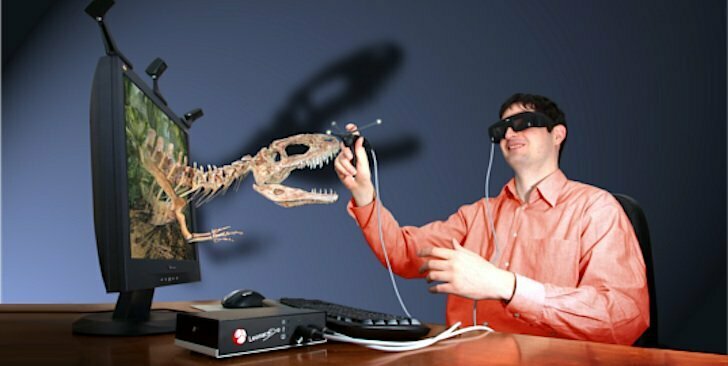 Leona3Do is a 3D manipulation system that combines passive 3D glasses with a wireless device called the Bird; with the included software that comes with all of the kits, the Bird allows the user to interact with a virtual 3D environment in real time like a 3D mouse. With the various softwares available, most of which are free, that interaction can be applied widely. LeoWorld is a modeling and animation application that makes modeling as intuitive as I’ve seen, yet remains incredibly powerful, “The real-time polygon optimization lets you easily shape any form with a speed never experienced before. Color the objects in 3D, change the lighting in real time, give physical attributes to virtual objects (changeable mass, gravity, impeccability, rebounding etc. ), create 3D animations, and export them into a video format.” This system can handle far more than modeling though; Vimensio Edit allows for creating 3D educational presentations without the need of programming knowledge. Students can push virtual cells around, dive into volcanoes, and explore deep seabeds, all from the classroom, and even the home. The Leona3Do portfolio of software is already impressive, powerful enough to teach welding, so it’s sure to be picked up by other hands-on training and education programs. I can see this being applied to training people to do everything from filleting tuna to performing brain surgery. The upcoming LeoConf lets groups of 50 watch a 3D presentation that’s being directed by a facilitator, so employees can see how a new product is constructed or investors can get a clear understanding of the operations of a novel process. Considering the kit starts at $500, this is an incredibly accessible technology; professional kits are $2000 and the SDK development kit requires a quote that I’ve yet to receive a response for. With such a low price, competitors will have to present major use improvements or sell their models at even lower prices. Either way, it’s good news for us.